Out of an entire area of wildflowers, only two of these came up this year… I'm curious as to what they are. Its purple color was a really nice contrast against the other flowers (before the weeds took over). Tags: flower, what is it? How Do You Say "2010"? Or… I could use google first.. sheesh. 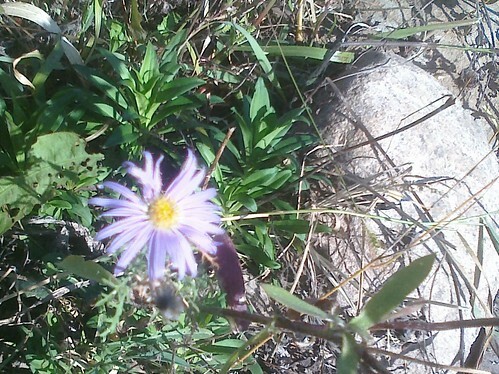 It looks like it's a "Purple Aster"
I concur on aster of some type, via Peterson's Field Guide. Profusely branched annual or biennial to 3 ft. which becomes a solid mound of lilac in autumn. Blooms low if mowed in spring. Abundant & spectacular along roadsides, purple aster blooms at the same time as Chamisa, making a wonderful color combination. Plant anytime, early fall is best. Water for more abundant flowering.